Actor Josh Duhamel teamed up with PetSmart Charities to raise awareness about the importance of pet adoption to save millions of more pets that are still in shelters, and was inspired after adopting Meatloaf. Duhamel rescued Meatloaf with his wife Fergie (The Black Eyed Peas – Fergie) from an adoption group in Los Angeles while searching for a companion for their 7-year-old dachshund, Zoe. 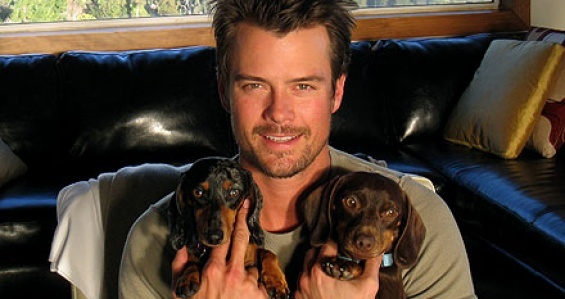 Meatloaf taught Duhamel that adopted pets are grateful for the love you have to give and hopes his own story can persuade others to consider pet adoption in the future to save the millions of pets who end up in shelters every year. Unfortunately Meatloaf passed away in April, “Meatloaf was truly a beautiful dog,” Duhamel tells PEOPLE of the aging dachshund he brought into his home. “He was the most lovable, appreciative, soulful little dude. He just turned out to be such a great pet, such a great friend, and ever since then I’ve been an advocate of rescuing. High-Five for 5 million pets adopted through PetSmart Charities‘ Adoption Centers in PetSmart® stores! To celebrate this achievement and to increase awareness about why pet adoption is important, PetSmart Charities has launched the “High-Five for My Pet Adoption” Video Contest for pet lovers to share their adoption stories and the joy adopted pets have brought to their lives. Animal Fair Media wants to express our deepest sympathy to Josh, Fergie and Zoe, for the loss of their beloved Meatloaf.